The colors that worked, worked really well, so I’d consider getting individual markers of this brand in the future, but I might not get an entire set again – we’ll see! Click on the image to see a larger version or for framed/unframed prints. Thanks for looking! This is an acrylic painting, painted of a layer of gesso layed down to create texture in the final image. Which, of course, you pretty much can’t SEE in this digital image unless you look more closely at a bigger version, but it’s there. Well, okay, maybe you can see a little bit in the sky part…. 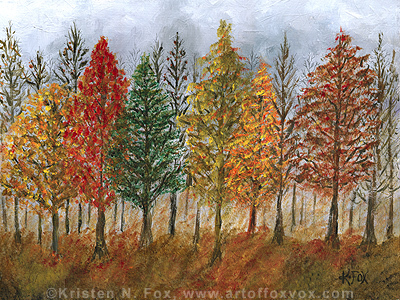 My inspiration for this painting was a drive along the NY Thruway in November – the autumn trees growing up to the clearing line for the road, the dead leaves on the ground, the leaden, overcast skies. I have the original hanging on the wall in a silver frame right now. 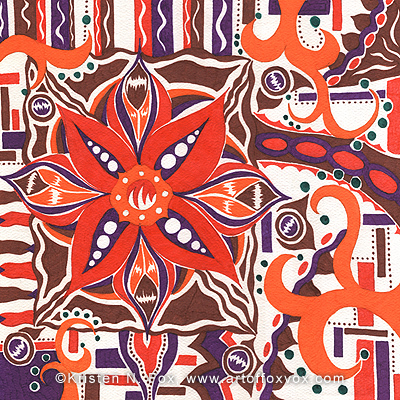 Click on the image to see a larger version, or for framed or unframed prints. Thanks for looking! 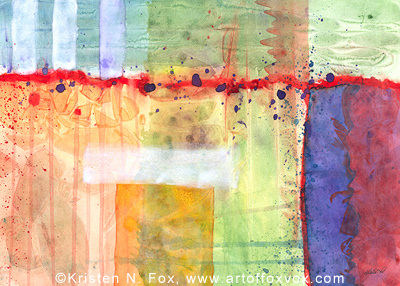 I was very happy with this abstract watercolor painting, and it was a LOT of fun playing with textures and shapes! Please click the image to see a larger zoom and for ordering framed or unframed prints, including canvas prints. And thanks for looking! 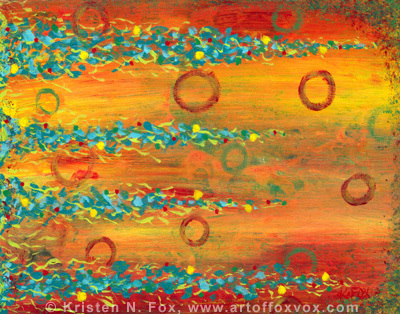 Fiesta is an abstract acrylic painting, original was 14″x10″. I keep wanting to put an exclamation point at the end of ‘Fiesta!’, so maybe I’ll do that from now on – LOL. I suppose it’s the turquoise color in the ‘confetti’ that makes me think of a Mexican fiesta, but also I think the painting is just fun. That’s all for today, just a little holiday Fiesta-ing for everyone! I finished this 12″x12″ abstract acrylic painting a few months ago while I was going through my ‘yellow-gold’ phase (apparently – LOL). 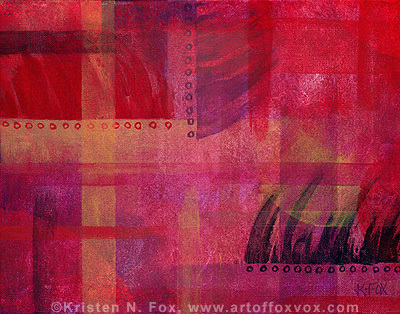 I had fun playing with the textures in this piece, as you can hopefully tell. 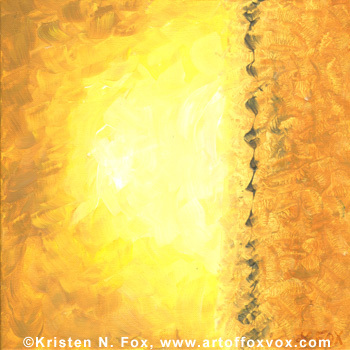 The brighter white-yellow light seemed to be emerging from hiding, thus the title! Click on image to see a zoom of the image or to purchase framed or unframed prints! And thanks for looking! Click the image to see a large image or for framed or unframed prints of various sizes. And as always, thanks for looking! I have such a backlog of images to post, so I figured I should get this one out of the way before winter started – LOL. 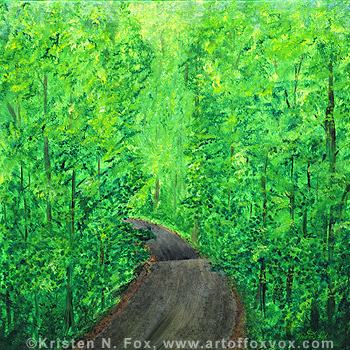 This painting is my attempt to capture the amazing thickness of verdant green leafage here in the Catskill Mountains in the spring. I’m not sure that my scan of the acrylic painting got all of the subtle green variations that I put into the original (and the small version certainly doesn’t express the brown of the tree trunks well), but I tried! The original is 20″x20″ on gallery-wrap canvas. The funny thing is that I have this painting sitting at the top of a tall shelf next to my desk, with a set of Futurama figurines in front of it – it’s like a bizarre version of Dorothy and friends down the yellow brick road – LOL!